You’re just riding waves, you need to start surfing!! I will never forget Bo saying those words to me as I was starting to get into short boat surfing. Years ago, I picked up a Necky Rip river boat, which is still a great transitional boat for those wanting to start surfing a short boat. After many times out in the Rip, I found I was dropping down waves and getting long rides. One day, I was surfing with an experienced buddy who both kayak and board surfs and when I asked him for some tips he very intensely told me “you are just riding waves, you need to start surfing, surfing is going this way and that way and running at an angle along the waves! !” These words have stuck with me to this day. These days, the only time I’m ever riding straight down a wave is when I am trying to gain speed, but as soon as the boat has gained speed I’m going left and right and up and down, not straight. Surfing is way more fun than riding waves! I began surfing with a sea kayak, which at the time had many advantages. It was easy to paddle the distance needed to a good break and I only needed small waves to surf long rides. Larger waves can be taken with these boats, but because of their length a steep wave may cause the bow to bury, which slows the boat allowing the wave to catch up. When the wave catches the boat, it will either purl (boat flips end over end) or broach (boat turns sideways and locks into the foam). Maneuvering a 16ft 65lb boat will require a lot of strength to achieve the change in direction whereas a surf kayak can be maneuvered quickly with less force from the body. In the time it takes to get a sea kayak just to change direction, a surf boat can make multiple turns with much less effort. A couple years ago the whole focus of my kayaking changed when I picked up a composite Mega Bullitt S surf kayak, which is a long High Performance (HP) style surf kayak. The maneuverability and speed of the boat were amazing. I was running down wave faces and bouncing off foam piles to gain speed with relative ease. I noticed my boat wasn’t spinning out and I could drive it right where I wanted because it had fins, which gave me more directional control. I was totally hooked on kayak surfing from the day I first paddled this boat. Having maneuverability is just plain fun! These surf kayaks (short boats) accelerate and turn quickly making it possible to play around in the pocket of the wave and those “oh crap” moments when the whole wave looks like it’s about the dump on you are easily turned into a fun surf with a quick turn down wave. By executing a turn just before the wave dumps, I can use the momentum I’ve gain to shoot out in front of the wave. Then, the foam pile will catch up and can be ridden out as the wave dissipates. By switching to a boat with fins, I was able to figure out what a surf kayak was really meant to do. I had been using an IC (International Class) boat (longer without fins) prior to getting the Bullitt S. I was having a blast with it, but until I tried this new boat, I had no idea how much more fun I could have and how much more I could do on a wave. All I wanted to do was surf and explore the potential of this new craft. Recently, I gave my IC boat another try and saw how much potential it had because I had an opportunity to grow a lot with my skills in my HP boat. They’re so much fun that I see a lot of my long boating friends purchasing composite surf kayaks and really getting in to learning the skill set needed for them. The experience of the paddler determines where they will start with surf kayaking. Someone new to kayaking may use a sit on top surf kayak, which is usually plastic, stable and designed to catching waves. The models usually have fins to help with maneuvering and the paddler is secured on the boat with thigh straps that sit on top of the knees so waves don’t wash them off the boat. The thigh straps easily slip off if the boat capsizes and the paddler can climb back on solo fairly easily. I highly recommend taking a class from a certified instructor. Not only will they give important safety tips, but they can also teach important skills such as water reading, wave selection, and how to maneuver. Plus, you will get a progression beyond the just going out and getting trashed learning curve. Paddlers with experience and a roll tend to start a step up from sit on top boats by trying out waves using a river boat with a planing hull. A planing hull is important because it allows the boat to gain the speed needed to catch and keep up with the waves. A creek boat or short play boat may be able to catch waves by being picked up and pushed along by the foam pile, but to “surf” more speed is needed and the way to accomplish that is with a composite surf kayak. “Surf Kayaks” are built specifically for performance on ocean waves. They are fast, highly maneuverable, and come in a variety of different styles. The main classifications are High Performance (HP) and International class (IC). These classifications are mostly determined by the length and style of the boat as well as how the paddler uses the boat to surf a wave. An IC boat is 118 inches or longer and does not have fins. They are designed to use the long edges of the boat to carve out turn, unless surfing backward and sideways is desired, it’s critical to use the edges of the boat to maintain control. HP boats are 108.25 inches or shorter. The shorter length means that fins are need to help control the boat because it has a shorter water line making it easier to spin around. The shorter length combined with the fins give the paddler control to turn the boat easier and also prevent it from spinning out. There are advantages and disadvantages to either style. The short HP boats need steeper waves to gain acceleration, but can turn faster whereas the IC boats are longer and don’t need as steep of a wave, but can also slip more easily. I personally prefer an HP boat near the maximum allowed length. My personal preference is an HP boat near the maximum allowed length. It has the advantage of a longer hull to help catch waves and fins to make it drive hard and crank out maneuvers and these boats are also easier to roll than the short HP versions. When I was looking for more performance than my longer HP could give me, I decided to try a short HP boat with sharp edges. For me, the advantage of this boat to make super tight turns, drive down through just about any part of the wave even while it is breaking was offset by the sharp edges, which ironically were what increased its performance. The edges made the boat prone to grabbing and flipping very easily especially in choppy conditions and they made it very difficult to roll. A more aggressive paddling style is needed to catch a wave in these shorter boats because they need to drop on the steepest parts of the wave to gain the speed to catch it whereas in a longer boat it’s possible to sit near the shoulder and wait for the wave of choice. 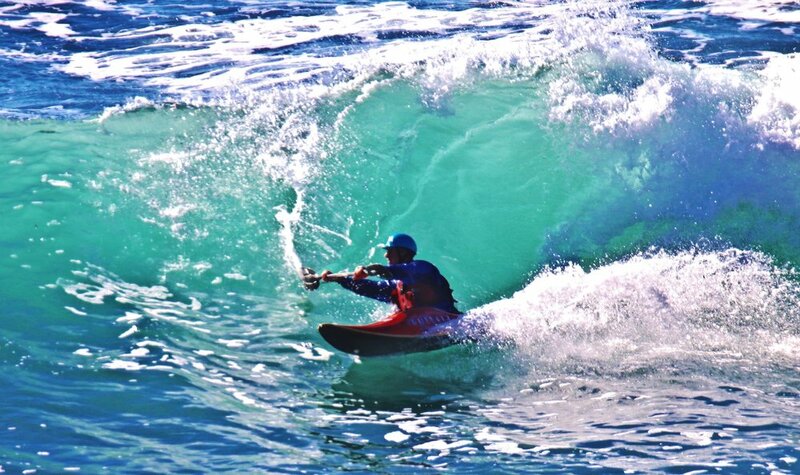 I have seen many highly experienced kayak surfers use shorter boats to tear up any wave they find and have a blast. My goal for kayak surfing is simply to have “fun” and I was not interested in putting in the time to make the smaller boat perform as it should. I feel it’s easier to learn the skills needed to maximize performance and fun using a more forgiving craft. There are numerous resources available in print and online for kayak surfing skills. I have read through many and have picked up tons of useful tips and information from them all. I can’t recommend any one resource, but do suggest everyone check out SURFKAYAKSKILLS.COM. This has been my go to spot as I’ve grown my skills. The website is well organized into different sections that will help anyone at any level practice drills to improve their skills. The site is funded by donations from paddlers. Often, I’ll read about a maneuver on the site incorporate it into my next day surfing. Again, another great option is to seek out classes with experienced instructors and follow up what was learned in small, friendly conditions until proficient then transfer those skills to progressively bigger conditions. Identifying a good wave to catch and big waves from small waves is a necessary skill. The best way to learn wave identification is to go surfing. Watch every wave, especially the ones your friends are catching! I have learned to recognize what a wave will do and how large the next wave will be just by spending time observing people surfing waves. Knowledge of how waves work is critical since proper positioning on the steepest part of the wave while avoiding unintentional fraternization with whitewater is needed in order to gain the speed required to efficiently control the kayak. With speed comes more control, allowing me to choose my position on a wave face. Sean Morley told me I needed to head into the foam pile and bounce off it to accelerate. Until he put it in that context, I had spent time avoiding the foam pile. It took some trial and error of being flipped and spun out to get it, but once I committed to driving into the foam, I felt it working. After many edges caught, noses planted and backward surfs, I have found the way to improve critical skills (i.e. bottom turns, top turns, cut backs and catching the drop) is committing with my whole body. It took me countless thrashings on top turns to figure out that holding back because I was afraid of wiping instead of committing my whole body was actually working against me. It felt wrong to lean my body into a wave and have the boat follow, but once I took control and committed, I didn’t wipe out as much. It’s critical to look where I want to go then fully rotate my body into the direction I’m looking. Don’t worry about the boat, it will follow. This change in mindset lead to a huge jump in my skills. Committing and practicing the basic skills needed have made kayak surfing much more fun. There is always something to work on and no matter the day’s conditions, I can still have fun practicing a drill or maneuver. I am hooked on surfing!! I think the draw to it may be that I still have so much to work on and learn (ok, some of the draw may be the shiny, new surf boat I have coming too). I attempted some local competitions this year in Davenport and Santa Cruz California. Getting out on the water and competing with the likes of many local pro level kayak surfers is very humbling and just watching them taught me a lot. The surf kayak community vibe is great: everyone is out there on the waves because they love to Surf, not just ride waves J.